Frank Herbert’s original Dune, published in serial and then novel form in the 1960s, long ago established itself as the ‘Lord of the Rings of Science-Fiction’. Heady praise indeed and largely deserved. It was not the first Sci-Fi to use the quasi-medieval or Renaissance template but it was certainly the most successful, creating a sprawling space opera that spawned many imitators and numerous (increasingly poor) sequels. In the 1970s several producer-directors fancied themselves as the only one to have the abilities to capture on screen the imagination revealed in the pages of Herbert’s cult book, but in the end the role fell to a most unlikely choice – American indie director David Lynch. Lynch, who up to that moment had worn the maverick moviemaker coat with gusto, jumped on the opportunity to show folks just what he was capable of in the aftermath of his well-received ‘The Elephant Man’, and a legend was born. Over the course of 1983 he and larger-than-life producer Dino de Laurentiis, struggled in the heat of Mexican deserts, with huge numbers of actors, extras and crew (some 1700 in total), cutting edge effects, never-ending rewrites, and budgetary convolutions so complex they’d give an accountant nightmares for life, all to produce the film version of the book. What eventually emerged on screen, after numerous post-production editing, was greeted with horror by the studio bosses back home. Lynch’s three-hour vision of what constituted a movie hardly matched mainstream Hollywood at the best of times but given the blue-sky freedom of Sci-Fi he had outdone himself – at least as far as the bigwigs and bean-counters were concerned. The movie underwent one of the most dramatic cutting-room re-edits in history, by all accounts two or three hours of celluloid ending up on the floor, and what emerged was a very different beast altogether. 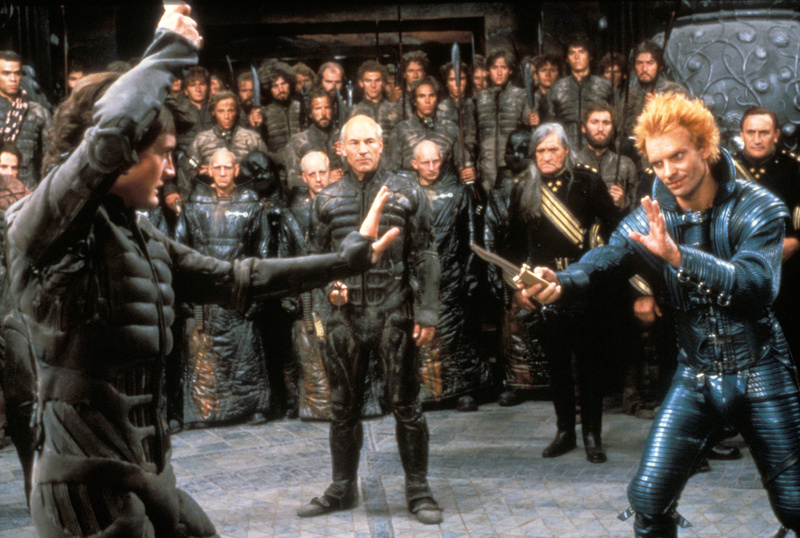 Unable to reconcile Lynch’s ‘Dune’ with what Hollywood thought constituted a ‘good, summer, blockbuster’ the mad, complex but probably ultimately coherent vision of Lynch came out an unmitigated, two hour mess after passing through the studio sieve. Movie making by committee is never a good thing, which is why artists are artists, and businessmen are businessmen. The director, with understandable hurt and anger, largely dissociated himself from the retouched product, and turned his back on a period of his life that left him severely depressed and his career in limbo for many years. At the box office the best efforts of a slick PR campaign could not overcome the reaction of early movie-goers, who voted with their feet – and cash. The bad word spread and ‘Dune’ the motion picture enjoyed a brief moment of notoriety before disappearing into video rental hell. There it might have all ended except, as time went on, and Hollywood epics became increasingly paint-by-number efforts, repetitious, unimaginative, unchallenging, Sci-Fi fans turned back to look at the good old days of earlier efforts and a thriving market in ‘Dune’ video and laser-disc bartering and selling emerged. Through the early internet the word spread and ‘Dune the motion picture’ took that oft followed post-movie theatre route from flop wannabe to cult hit. Today the movie has been reissued in several formats, including a number of different special editions, and old versions of different lengths still do the rounds at conventions and on eBay. The definitive cinematic version, digitally enhanced, was released this year on Blu-ray, not that different from the original cinematic release, but legend still holds that a Holy Grail version exists with all the snipped scenes (reputably three hours worth) restored and every now and again the message boards will become feverish with excitement with some new, soon to fade, rumour of an imminent ‘Director’s Cut’. However, what of the movie itself? Well for all its flaws, all its stilted dialogue and OTT acting, convoluted storylines and frequent plot-holes, scenes of mind-numbing boredom or just plain silliness, the sense that one is watching something EPIC, a grand almost mythic spectacle remains. This is SCI-FI, all CAPS on, and there is no mistaking it. You forgive the wooden acting and the head-scratching pseudo-religious pontificating. If you’ve ever gone through George Lucas’ embarrassingly awful Jedi invisible thingamabobs crap then Herbert and Lynch’s spiritual musings seems positively sane and believable by comparison. The story line is fairly coherent, you have a beginning, middle and end, lots of cool stuff happens in-between, you get to visit planets and vistas that are truly strange in a civilization with a real veneer of authenticity that the Star Wars or Trekkie cliques could only hope to emulate. This movie looks GORGEOUS. Lynch, with the help of some brilliant British cinematographers, was clearly on top of his game and it tells. Never have deserts looked so good as they do in this – at least since the days of David Lean. The set designs are amazing, all Italian baroque and Arabic-inspired designs and colours that look more real than anything not real should. The costumes are wonderful, a quasi-middle European style more at home in some Ruritarian kingdom than in space – but they work, and have become the definition of retro-kitsch. The question of course remains: if you haven’t seen ‘Dune’ before would I recommend it to you? Well, honestly, that is a difficult one. I love the movie, flaws included, but then as a fan of the book I see it as a faithful cinematic vision of the spirit of the book – if not always of its actual written word. Lynch gets so much right that you can forgive what he gets wrong and literary inspiration aside, it still stands in its own right. So all I can say to you is try a rental (preferably the restored cinematic version on DVD or Blu-ray). See what you think, and do so with an open mind. It’s not ‘Bladerunner’, its not ‘Watchmen’, but it is still pretty damn good. And if you happen to know where a five hour version of the movie could be found, please, don’t keep it to yourself.